Your cutting becomes particularly effective and precise when using a cutter. GRAFIS offers you an optional uncomplicated interface for controlling single ply or multiple ply cutters. 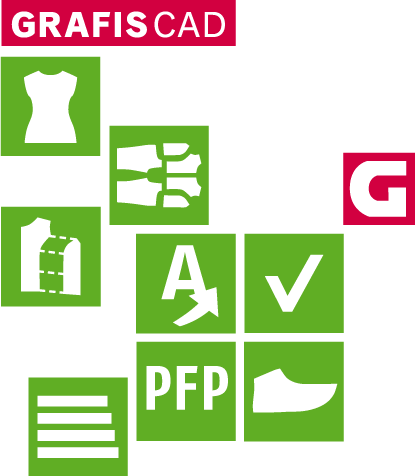 The GRAFIS CutterControl interface supports your automated cutting of pattern pieces. Apart from controlling the knives for the cut contours, many further settings are available to adapt the cutter output to your requirements. You have the option to start cutter output automatically or to control each piece individually. You can also choose to determine the starting position, the cutting direction and the cut sequence manually. Obviously, in addition to your cutting tools you can also control the drawing and drill tools of your cutter separately. Your advantage for cutter output is the ability to separate especially long layplans into segments, enabling you to achieve great results even with a small cutter. The use of fusing blocks is also accommodated during cutter control. For the fine cutting, a separate cutter file is generated within a layplan, simplifying subsequent cutting of the small pieces. With the help of special text annotation, bundling devices can also be controlled. The GRAFIS Team is happy to collaborate with you for further customisation.